Lauren Walker has been teaching yoga and meditation since 1997. She splits her time between New England and Montana. A writer since childhood, Lauren publishes widely and has written features for The New York Times, The Jerusalem Post, and Salon.com. She has a periodic yoga column at MNN.com, and she’s been featured in Yoga Journal. Lauren is a wandering spirit, and has lived and worked all over the world. She continues to travel and teach workshops and classes in the United States, Canada, and internationally. She is also a composer, hockey player, avid skier, and primitive-skills enthusiast. 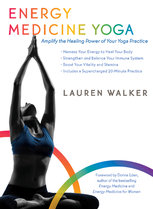 For more on Lauren and Energy Medicine Yoga, please visit EMYoga.net.